Our Christmas appeal, The Frugal Feast has officially wrapped up and we are completely blown away by the response we have received! With your help we have absolutely smashed our target to raise $10,000 in food and financial donations, with a grand total of $11,788! This is the best outcome of any fundraising appeal we have ever held! To everyone who donated, purchased a copy of our fundraising cook book, shared a link to our website, joined the conversation online, volunteered their time to host an event, or supported us with their recipes and their words – thank you! We would particularly like to thank Gai Brotman’s office and the parents from our Campbell Cottage Early Learning Centre for their generation donations of food! But most importantly, we want to thank our amazing Food Hub volunteers, who give up their time each week to stock the shelves, assist our clients, and keep the whole operation running smoothly – none of this would be possible without their compassion and dedication. Although the appeal has officially wrapped up, we’re still selling copies of The Frugal Feast! The book features content from prominent and everyday Canberrans, and the beautiful artwork has been created by Juliette Dudley, a talented local artist. 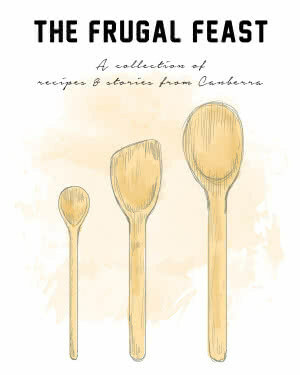 Click here to purchase a copy of The Frugal Feast – a collection of recipes and stories from Canberra. All funds raised through sales will be donated to the Food Hub. Please note: purchases after Wednesday 24 December 2014 will be processed on Monday 5 January 2015.